Maybe you were parked underneath a tree on a stormy night. Or perhaps you left your car parked outside for a long time and came back to a chilling discovery. But either way, the result is just as unpleasant: if a tree falls on your car, it is definitely not good news. So what do you do? If you recently encountered a tree smashing your car, you are probably wondering if your insurance is going to cover the damages. If you have your state’s minimum coverage, you are probably out of luck. Liability insurance is not going to cover an “act of God,” as it is known, or in this case, an act of tree. The only way your car insurance is going to cover a tree which has fallen on your car is by purchasing comprehensive insurance coverage before the damage occurs. 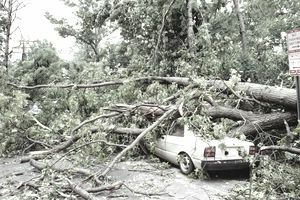 Parking your car outside on a regular basis leaves your car susceptible to storm damage. A major contributor to property damage is falling trees during heavy wind and snow storms. Comprehensive coverage will repair damages to both fallen trees due to wind and snow, plus other forms of storm damage such as hail damage. But parking your car underneath a carport or inside a garage is a good way to avoid this damage in the first place. Dead trees often become falling trees after a long period of time. Sometimes while driving down the road, a large tree limb or an entire tree can come crashing down. Anytime your car is hit by a falling object, comprehensive coverage will cover the cost of repairs on your vehicle, minus your deductible. Hitting a tree which has already fallen on the road is handled differently than a tree that has fallen on top of your vehicle. Colliding with a tree lying on the road is considered a collision. Collision coverage will need to be listed on your car insurance policy in order for your insurance company to pay for repairs. Your deductible will apply unless you have been racking up a reduced deductible with a vanishing deductible option. What is the difference between a tree falling on your car and hitting one lying in the road? It is always your responsibility to be looking for obstacles on the road, and you ought to be able to stop without a collision. Falling objects are often unavoidable, which is what makes it covered by comprehensive insurance. How Do I Handle Tree Damage With My Insurer? Make sure to take lots of photos and document everything! Then, file the claim with your insurance company. Ask your insurance agent or the claims representative what you can do to speed up the claims process. Most companies allow you to take photos of the tree on the vehicle so work can begin to remove the tree and possibly have the vehicle towed. It is recommended to use your insurance company's preferred body shop to speed up the process even more. Clearly, a tree falling on your car can cause a lot of damage. The best protection for your vehicle is storing it in a garage. Of course, it is not always possible. If you frequently park outside near trees, definitely consider adding comprehensive coverage to your car insurance policy so you will be protected against a loss. Is Hitting a Flying Object a Comp or Collision Claim? What Does Comprehensive Auto Insurance Really Cover? Does Your Auto Insurance Cover Engine Fires?